Every busy workplace needs one of these time-saving bench top bag sealing tape dispensers. 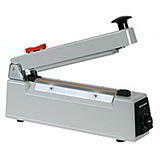 Specifically designed for use with 9, 12 or 16mm coloured vinyl bag sealer tape in 66m rolls in order to improve presentation, colour code and speed up polythene bag sealing operations. 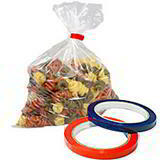 These bag sealing dispensers can be used freestanding or can be screwed directly to the work surface to improve stability. 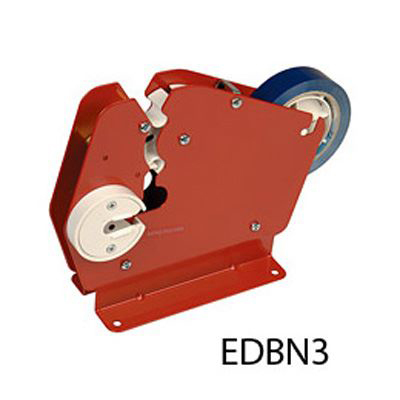 EDBN1 Plastic Dispenser- a basic bag neck sealer suitable for 9-12mm tape. 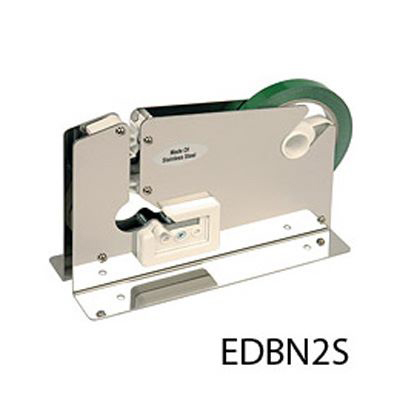 EDBN2 Metal Dispenser - a popualr metal bag neck sealer with a 12mm throat and suitable for 9-12mm tapes. 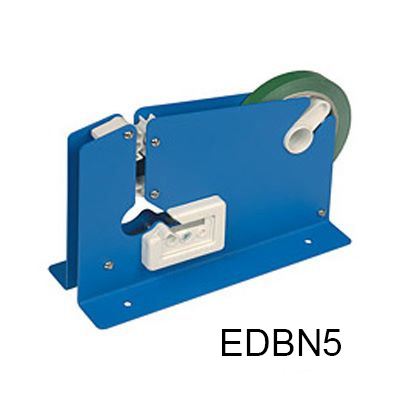 EDBN5 Metal Dispenser With Cutter- one of our most popular bag neck sealers due to its low price and combined trimming blade. 7mm throat width and suitable for use with 9-12mm bag sealing tape. EDBN2S Stainless Steel Dispenser- an upgraded version of the EDBN2 intended for use in catering and food preparation areas where strict hygiene is essential. EDBN3 Heavy Duty Metal Dispenser- our most popular heavy duty, wide necked metal dispenser with a 12mm throat and combined trimming blade. Suitable for use with 12-16mm bag neck sealer tape. EDBN4 Pro Series Heavy Duty Metal Dispenser- our "flagship" wide neck metal dispenser with a trimming blade, adjustable break and 16mm throat width for sealing heavier gauge poly bags. 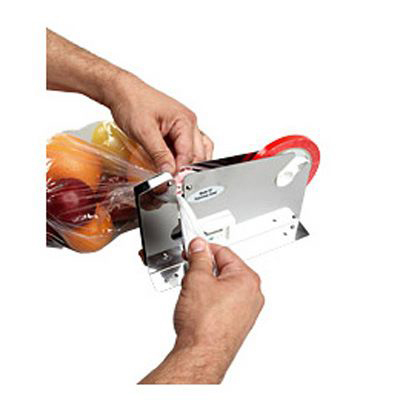 The only dispenser in the range that can accomodate 9-16mm bag neck sealer tape. 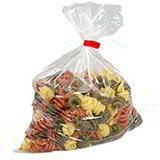 Order one today and speed up your bag sealing operation.They're in stock and ready to go when you are! And no delay - orders received today will be despatched within 2 hours. And don't forget your bag sealing tape.